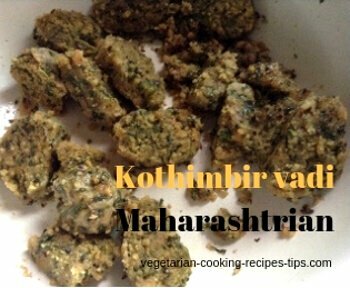 How to make Maharashtrian kothimbir vadi - Dhaniya coriander wadi. 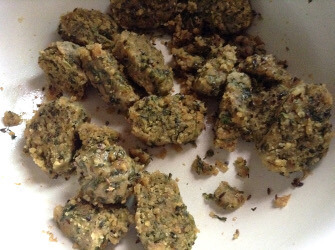 Kothimbir vadi is served as a snack or a side dish recipe. 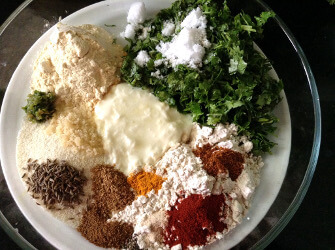 Kothimbir wadi is a winter food recipe. Dhania / cilantro / kothimbir / coriander leaves are available in plenty in winter season. 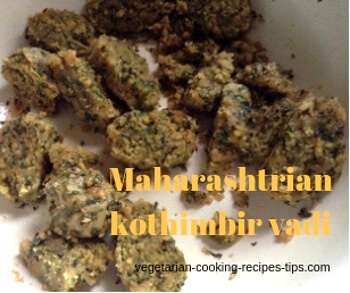 You may make kothimbir vadi in advance and serve it later. So it is good to make for a party, get together, lunch box, picnic etc. Mix together all the ingredients. Use water as necessary. Keep aside for 10 minutes if you have time. Divide dough in to 2 or 3 logs as shown below. Place the logs into the steamer as shown below and steam for 15 minutes. See note below. After steaming, keep the the logs aside for 10-15 minutes to cool. After that cut the logs in slices as shown below. Now to make tempering, heat a pan, add oil. 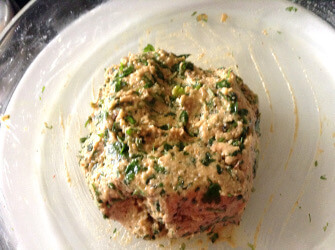 Add mustard/rai and cumin/jeera seeds. let the seeds splutter. Add asafotida/hing, sesame seeds, curry leaves. Add the cut kothimbir vadi to the tempering. 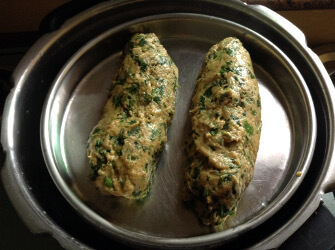 Mix kothimbir vadi to coat with tempering. Keep the flame low. 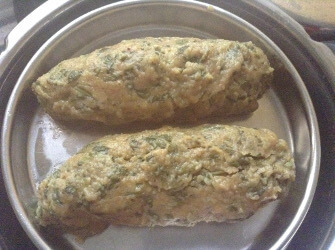 If you wit\sh, you may serve coriander vadi now. Or you may let it brown a little and then serve it. 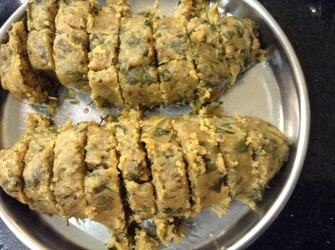 Kothimbir vadi may be served at room temperature as a side dish. So it is a good accompaniment for any meal. To take along with lunch or for a party. 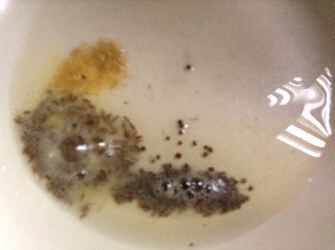 Use a steamer if you have otherwise, use a large vessel and a colander or a plate to keep in it.